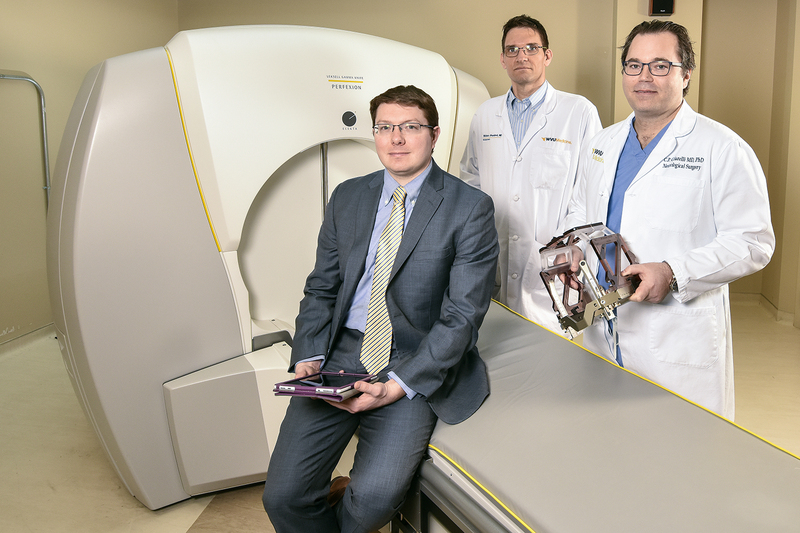 MORGANTOWN, W.Va. – Gamma Knife technology may not be new, but WVU Medicine physicians are looking at new and innovative ways to combine it with other treatments to improve the long-term survival rate for patients with neurological conditions and metastatic cancers of the brain. Gamma Knife is a form of radiation treatment that targets specific areas of the brain, delivering a highly concentrated dose to the affected area without causing significant damage to the surrounding area. This form of treatment decreases the likelihood of cognitive deficits in patients and can be used to treat vascular malformations and pain syndromes as well. The treatment is ideal for inoperable tumors, but can be used in combination with surgical interventions to increase their effectiveness. “Radiation treatments with the Gamma Knife cause controlled cell death in the affected area without having to intervene surgically,” Christopher Cifarelli, M.D., Ph.D., director of the WVU Medicine Gamma Knife program, said. Gamma Knife, which just celebrated its 50th year of use, has been used in the United States since 1988. WVU Medicine J.W. Ruby Memorial Hospital has had a Gamma Knife since 2002. The current version at Ruby Memorial – the only one in West Virginia – was installed in 2008. It is recognized as a Center of Excellence by the International Gamma Knife Research Foundation for its participation in clinical trials regarding Gamma Knife radiation. Working with other members of the International Gamma Knife Foundation, Cifarelli and his team are currently concluding clinical trials focused on the timing of treatments in metastatic disease and the expansion of diagnoses that can be treated using Gamma Knife. Membership in the International Gamma Knife Foundation gives the team the opportunity to draw on international data in their research, giving a wider look at the impact of treatments.